Let us all bow our heads in thanks to Kraft Foods for packaging macaroni and cheese in a form we don't have to turn the oven on to make. My kids love it, anyway. My youngest thrives on the stuff. That and ramen noodles. It's cheap, and a lot of people will eat it. Except my wife. I'm not a real fan, either. I don't hate it like my wife does, but I can't stand to eat it like it is. The sauce is usually runny and, although it's made with cheese by-products (what the heck is a cheese by-product? ), tastes like its was only placed next to real cheese in the hopes that it might get an idea of what it should taste like. It didn't work, but hey, they tried. I've always got to add something to it, too. Cut up hot dogs, creole seasoning, and catsup come to mind. Everything crappy tasting gets covered up by catsup and hot sauce, doesn't it? As much as my kids love the packaged stuff, and the off-brands are too expensive, I'm all about good flavor. 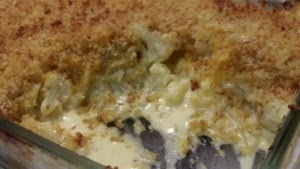 I want a macaroni and cheese dish an adult can enjoy. Something I can enjoy without trying to drown out the taste with cayenne pepper and castup. Something that actually tastes like it has cheese in it instead of cheese byproducts. This recipe for macaroni and cheese does exactly that. As much as I like Noodles and Company as a fast food chain, I like this mac and cheese much better than theirs. Or the stuff at the supermarket deli. Sorry guys. I'm eating at home, tonight. Fresh bread crumbs work best. Don't bother with over-priced, days old crap from the grocery store. Pulse 3 slices of bread in your food processor until they turn into course crumbs. It will take you all of 2 minutes and it's much tastier. If you can, use whole milk. 2%, or skim milk, won't be creamy enough. If you're going to go all out with real cheese, it makes no sense to skimp on the milk. 1 3/4 cups chicken broth or vegetable broth. In a large pot, bring 4 quarts of water to a boil over high heat. While you're waiting, combine the mustard and water in a small bowl. Stir until smooth and set aside. 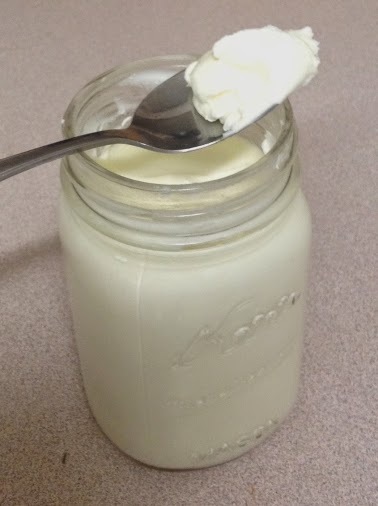 Melt 2 Tbl of butter in a small saucepan over medium heat (or use the microwave, about 30 seconds). Toss with the breadcrumbs and set aside. Once the water is boiling, add 1 Tbl salt and the macaroni. Cook until mostly tender, about 10 minutes. While the pasta is cooking, preheat the oven to 400 degrees Fahrenheit, making sure the top rack is in the middle position. Drain the cooked pasta in a colander, and leave it to fully drain while you continue. Wipe the pot dry and return to the stove. Over medium heat, add the rest of the butter to the pot to melt it. Stir in the garlic, mustard mixture, and cayenne pepper. Cook about 30 seconds, until fragrant. Stir in the flour and cook until golden, about 1 minute. Add the milk and broth slowly, whisking it into the flour mixture until smooth. Bring it to a simmer, reducing the heat to medium-low sow it doesn't boil. Cook until slightly thickened, whisking it often to avoid burning; about 5 or 6 minutes. Remove the sauce from the heat and whisk in the colby-jack and cheddar cheese until it's completely melted into the sauce. Season with salt and pepper to taste. Stir in the cooked macaroni, breaking up any clumped bits, until well combined. Spray a 9” x 13” baking dish with cooking spray. Pour the macaroni mixture into the dish and spread evenly with a rubber spatula. Sprinkle the breadcrumb mixture evenly over the top. Bake on the center rack until golden brown and bubbling; about 30 minutes. You can easily customize this recipe. Play around with the kinds of cheese you use, just be careful with hard cheeses like extra-sharp cheddar. By themselves, they could make the dish really greasy. I used a combination of extra-sharp cheddar and a colby-jack blend because that's what I had on hand, but straight colby cheese with the cheddar would have stronger flavor. Get creative! Try gorgonzola or blue cheese cut with queso fresco, if want to. Add cooked and chopped bacon or cooked hamburger. Add chili powder with the cayenne and garlic. Brown the butter and add Andouie sausage. Why not? If you come up with something interesting, I'd love to hear about it in the comments, below. With summer in full swing, cool, tasty treats are in high demand. At least with my kids they are. Not me, though. No no. 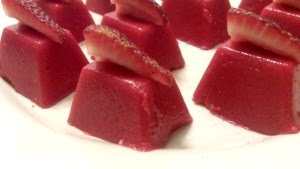 I'd never admit to make these Jello treats for myself. Well, maybe I'll admit it. They are pretty tasty. It's been some time since I did a Jello recipe, too. Gotta keep up the Mormon stereotypes, don't I? I can see it now, “Tales of the Jello Eaters,” a new book by Clive Barker. Heh, heh. Okay, maybe not. This is a recipe I modified from Kraft Foods. I actually use a different brand of flavored gelatin, but most people know it as Jello, no matter who makes it. This one combines strawberry gelatin, sour cream, and fresh strawberries. We're going to break with tradition and put the fruit on top, instead of mixing it in so it can sink to the bottom. If you've every been to an LDS ward social, you know of what I speak. This way, is tastier, and more elegant. Who said Jello can't have class? 1 package (3 oz) strawberry flavored gelatin. 5 fresh strawberries, stemmed and quartered. Spray the ice cube tray with cooking spray and set aside. Mix the boiling water with the gelatin in a large bowl. Whisk until completely dissolved, about 2 minutes. Add the sour cream. Gently mix until completely incorporated. Divide the mixture evenly between the sections of the prepared ice cube tray. Refrigerate until very firm, at least 20 minutes. In the meantime, remove the stems from the strawberries and quarter them. When the gelatin mixture is firm, fill the sink about halfway with very warm water. Briefly dip the bottom of the ice cube tray into the water, and remove. This will loosen the gelatin and make it easier to unmold. Put a plate or small baking pan, upside down, on top of the ice cube tray. Invert them both, together, and give the bottom a quick tap on the counter to unmold the gelatin cubes. Place one quarter of a strawberry on top, and serve. Most ice cube trays have about 14 sections, so you'll have two quarters of a strawberry left. Eat them before your kids do. Jello is a registered trademark ® of Kraft Foods. What could be more romantic that the scene in Disney's Lady and the Tramp where our protagonists share a plate of spaghetti and meatballs, ending in their first kiss? Swoon! Am I the only one that has a hard time thinking of wads of meat as romantic? It's just weird. Pasta, maybe, but cooked meat wads? They were dogs. Dogs are meat eaters. I guess is makes a kind of perverse sense. But, seriously? Romance aside, it's hard to beat a tasty, moist meatball, smothered in thick tomato sauce, gently resting on top of a pile of spaghetti, cooked just al dente. Sigh. Maybe I'm a romantic after all. First, meatballs should be tender. I don't want to bounce them off the walls or play table tennis with them, thank you. Fortunately, this recipe delivers in that department. I make a quick tomato sauce of my own for use with this recipe, but you can use canned, if you must. Grating your own Parmesan is best. The measurements given are for the grated form, not the solid block form. In case you don't know, bulk sausage is sausage sold before being formed into casings. If you can't get it that way, remove the meat from the casings before proceeding. Pour about 4 quarts of water into a large cooking pot and set it on a a cold burner. Don't start heating it just yet. We just want it to be ready to go. Add the olive oil to a saucepan. Heat both over medium heat until the oil is just starting to shimmer. Add the garlic and cook until fragrant, but not brown, about 30 seconds. Stir in the canned tomatoes, along with the canning liquid, and the dried basil. If using fresh basil, save it for later. Using an immersion blender, blend the tomato mixture enough to break up the heavy dice, but still leave small chunks. Bring to a simmer and cook until slightly thickened, about 20 minutes. Stir in the sugar and season with salt and pepper to taste. If you are using fresh basil, add it now. Set aside. Cut the crusts from the bread and tear into small pieces. Add the bread and buttermillk, or yogurt, to a large bowl and mash into a paste. The Italians call this a “panada.” Add the ground beef, Italian sausage, grated Parmesan, egg yolk, minced garlic, 3/4 tsp salt and 1/8 tsp pepper to the bread mixture. Stir to combine. Using 2 – 3 Tbl of the meat mixture at a time, roll it between your palms to form them into 1 1/2-inch balls. You'll end up making about 12 - 13 meatballs, this way. Make sure they're packed pretty well, so they don't fall apart while cooking, but don't overdo it. Now is the time to turn the heat under the pasta water up to high, to bring it to a boil. In the meantime, pour olive oil into a skillet to a depth of about 1/4 inch. Heat over medium-high until the oil starts to shimmer. Carefully add the meatballs, one at a time in a single layer. Cook until nicely browned, gently turning once through the cooking cycle, about 10 minutes. Remove the cooked meatballs from the pan and transfer them to a paper towel line plate. Pour off the remaining oil in the skillet to discard it. Reduce the heat to medium and return the skillet to the stove. Pour in about a cup of the sauce and deglaze the skillet, scraping up the yummy browned bits (or “fond”) off the bottom. Stir in the rest of the sauce and bring to a simmer. Reduce the heat to low and return the meatballs to the skillet. Cover and let simmer while the pasta cooks. The pasta water should be boiling about now. Add the spaghetti and 1 Tbl salt. Cook until al dente, about 10 minutes. Reserve 1/2 cup of the cooking liquid and drain the rest. Remove the meatballs from the sauce and set aside on a clean plate. Add the reserved pasta water to the tomato sauce and stir in to “loosen” the sauce. Taste the sauce, adjusting the seasoning if needed. Pour the sauce over the cooked spaghetti and toss to coat. Divide the pasta between four bowls. 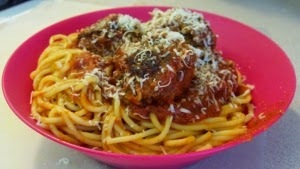 Top with meatballs, more grated Parmesan cheese as desired, and serve. As a kid, I thought there were only a limited number of things that you should put on a pizza. Things like pepperoni, Italian sausage, peppers, olives, tomatoes, mushrooms, onions, cheese, and the like. You know. All the things you can order at any local pizza chain. As an adult, I put away childish things (except for acting childish once in a while) and learned that there is so much more out there in pizza land. Chicken, artichoke hearts, fresh herbs, eggs, broccoli, spinach … well, I'll skip the spinach, but you get the idea. Let's face it. Pizza is basically flat bread with edible stuff on it. Why limit ourselves to just a few ingredient combinations? And don't think that cheese and sauce are sacred. Not all pizza has cheese. Early Italian pizza was just sauce baked flat bread with tomato sauce. American's added the cheesy bits. Not all pizzas have sauce, either. Some just pile the other ingredients on. I'm not suggesting we treat pizza like herbed foccacia with a few olives dotted on it (although we could). Let's just broaden our horizons a little. A few months ago I got this weird idea of turning various classic salads and sandwiches into pizza. I've since learned there are a few chefs already doing that, but more than one person can have a good idea so, I'm not going to apologize. 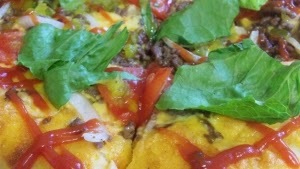 What about a cheeseburger pizza? That's a classic American sandwich. I fooled around, making a couple different ways, and they were pretty good. I have no idea what the actual ingredient amounts were. I was winging it. The listed ingredient amounts are guesses. Just don't put on too much of any one thing. When it comes to pizza, piling too much stuff on doesn't make it better. When I make cheeseburgers, I use sharp cheddar. Because cheddar can get greasy when it melts, which is fine when it drips off the burger, but not so fine on a pizza, I opted for a combination of mozzarella, colby, and Monterey jack. Heat the vegetable oil in a heavy skillet over medium heat, until shimmering. Add half of the onion, setting the rest aside, and a dash of salt. Cook, stirring occasionally, until just softened. Add the ground beef, breaking it up with a wooden spoon, and cook until no longer pink. Stir in the garlic and cook for about 30 seconds more, until fragrant. Remove from heat and let cool. Preheat the oven to 425 degrees, Fahrenheit. Roll out the pizza dough onto a pizza pan, baking sheet, or whatever you use for pizza, and let it rest while you get everything else ready. Mix the tomato sauce and mayonnaise together, about 3 parts mayo to 1 part tomato sauce. Add salt and pepper to taste. Better yet, use my fry sauce recipe. Spread the sauce in a thin layer over the pizza dough. This is the “secret sauce” part of the burger. Sprinkle the mozzarella cheese evenly over the sauce. Next, sprinkle the ground beef/onion mixture, chopped tomato and the remaining chopped onion. Lastly, sprinkle on the colby jack cheese. Bake in the oven for 15 to 18 minutes, or until the dough is cooked through and the cheese is melted and toasty. Rotate the pan halfway through, to ensure even cooking. Remove from the oven. Squeeze most of the liquid from the pickle relish, and dot all over the pizza. Decoratively squeeze catsup in thin lines, next (I used a crosshatch pattern). Finally, spread the lettuce pieces over the pizza. Slice and serve. Please don't consider my recipe gospel. Add various herbs and spices to the meat mixture. Hold the pickles; hold the lettuce. Use mustard. Blue cheese, would be a great substitution for the, colby-jack mixture. The point is to have tasty, tasty, pizza fun.